The BHFS probe is a discrete point fluid sampler tool. The probe is lowered to a specific interval within the borehole and the piston is opened. Once the 1 or 2-liter sample chamber is filled, the piston is closed, and the probe is brought to the surface. Once the fluid sampler is at the surface you open the valve at the bottom of the probe and the sample can be drained into your sample container. The sampler tool is supplied as a stand-alone tool. The BHFS operates with the Matrix logging system and can be run on any standard wireline (mono, 4 or 7 conductor, coax). Heavy duty, high-torque motor with ball screw drive. Small 51 mm diameter, easy one-person use. Bottom sub encloses fluid sampler transfer valve. Can specify sampling chambers of 1 or 2 liters. Larger capacities available upon demand. Diameter 51 mm 2.0 in. 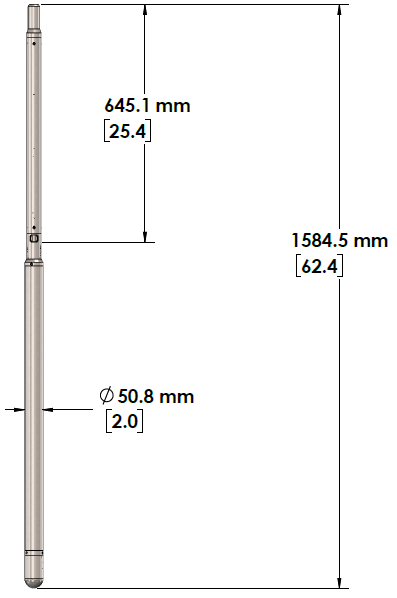 Length 1.58 m 62.4 in. Weight 6.8 Kg 15 lbs.